This review has not yet been approved by the owner of this writing service. If you are the webmaster of Customwritingbay.ca, please Contact Us to approve or remove this review. 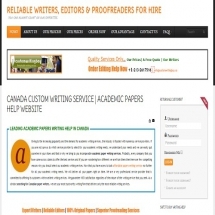 At a glance, CustomWritingBay.ca looks promising – it has a relatively modern design and a pleasant color pattern. However, when you start looking through it, this illusion immediately disperses. The website is stuffed with inordinate amounts of filler text, most of which doesn’t contain any useful information whatsoever. There is no comprehensive pricelist – only a poorly designed price calculator. FAQ is a joke – it is just another page of filler that fails to answer a single question about the service’s policies. Prices range from $10.95 to $50.45 per page, depending on the degree of urgency and academic level. However, one should note that the price is mainly affected by how soon you need it, not how complicated it is – which cannot but raise certain suspicions. One can hardly believe that difference between a high school and PhD level assignments would be about $10 irrespectively of deadline. Customer support is available via chat, email, online query form and phone. Whichever method you use, operators are responsive, polite, well-informed and communicate in good English. If they have to consult some additional sources of information before answering you, they tell you this so that you know you are not waiting in vain. In other words, support makes a much more pleasant impression than the rest of the service. There are no writing samples on the website, but judging by its contents, this service certainly prefers quantity to quality. While texts aren’t exactly awful, it is hard to believe that they were written by native English speakers, as the site seems to suggest. No direct contact between writers and clients, all communication is carried out through customer support. In general, CustomWritingBay.ca leaves a twofold impression. On the one hand, it doesn’t look like much: a poorly designed website, suspicious pricing policy, poorly written filler text all over the place don’t sell it very well. However, the way customer support handles your problems suggests that the service’s inner workings may be a bit smoother than its outward appearance suggests.